The bathroom is a unique room: a fairly small but serene space where you can retreat, get away from the noise of life, and exhale. There are different types of bathrooms, including the master bath and the functional family bathroom with a full bath alone or a convenient three-quarter bath layout comprising a toilet, shower, and sink. There is also a half bathroom, also known as powder room, which is the smallest of the bathrooms. For many years, bathrooms have been regarded as spaces that take care of “function” and nothing else, but things are changing, much like the TV room has evolved into an entertainment room with a huge LED TV and surround sound. The size of the bathroom has not changed much, but it remains the second most expensive room in a home, after the kitchen – owing to fixtures, appliances, and unique finishes. This is one of those single additions that completely transform the look and feel of a space. For a stunning effect, consider swapping out that medicine cabinet with a huge, crafty driftwood mirror. Bathrooms typically have lots of porcelain and ceramic surfaces, so you may consider adding a bit of organic color and texture to personalize the space. You can try a woven basket, fringed towels, kilim-style rug, or a carved wood stool. Wood-like tiles in a herringbone pattern placed in the bath are not only more hard wearing, but also less expensive than laying wood floors, so they create the impression of wood while improving your budget. Depending on how restrictive your budget is, laying tiles can be a very expensive endeavor. Fortunately, you can save money by focusing on high-impact areas (like the bath floor instead of the shower stall floor and walls) or limiting the amount of tile and painting the rest. If you have a little more money, you can consider alternating artistic (expensive) tiles with cheaper tiles to make them even more noticeable. 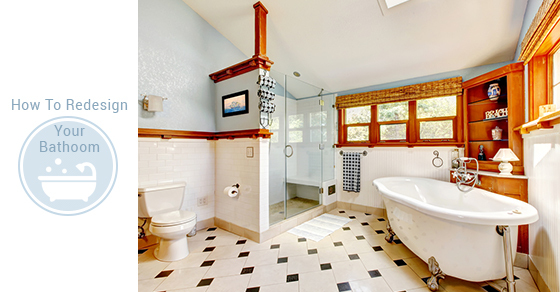 If you are short on ideas to design your bathroom, you can simply update your fixtures. Items like sink taps, light fixtures, drawer pulls, and towel racks are not that expensive, yet they can make a huge difference in the look and feel of your bathroom.